Fans of Monsters, Inc. rejoice! A new animated series, Monsters at Work, will premiere on Disney+ in 2020. And that isn’t all the good news — Billy Crystal and John Goodman will be returning to voice Mike and Sulley! 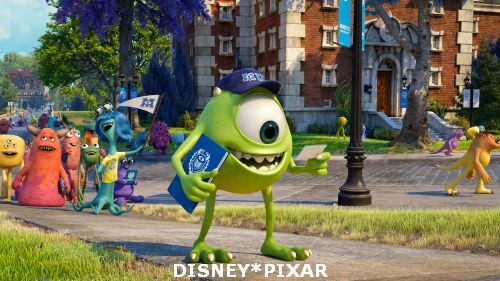 The new series is inspired by Disney * Pixar’s original, Academy Award-winning film Monsters, Inc. The series will pick up six months after the film. We will get to see the monsters of Monsters, Inc. harvesting laughter rather than screams to fuel the city of Monstropolis. In the new series we will meet Tylor Tuskmon, a young mechanic with dreams of working his way from a mechanic on the Monsters, Inc. Facilities Team to being a fellow jokester with his idols Mike and Sulley. Familiar voices from the Monsters films will include John Ratzenberger as Yeti and a new character Bernard, Jennifer Tilly as Celia Mae, and Bob Peterson as Roze the twin to his original character Roz. Disney+ will launch later this year as the streaming home for movies and shows from Disney, Pixar, Marvel, Star Wars, and National Geographic. Disney+ will offer ad-free programming with a variety of original feature films, documentaries, live-action and animated series, short-form content, and unprecedented access to Disney’s library of film and television entertainment. Disney+ will be the exclusive streaming home for films released by Walt Disney Studios in 2019 including Captain Marvel, Avengers: Endgame, Toy Story 4, The Lion King, Aladdin, and Star Wars Episode IX. Will you be signing up for Disney+? Are you anxious to see Mike and Sulley on the small screen? Let us know in the comments below! Click below to subscribe to the AllEars® newsletter so you don’t miss any of the latest Disney Channel news!